Brooke and Aly are sisters, but they’re more than family—they’re family business owners! 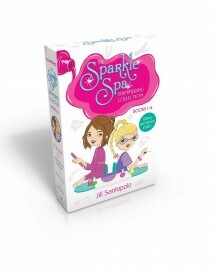 This boxed set includes four Sparkle Spa stories, from the start of their kids-only nail salon to polished (and unpolished!) adventures that follow. In True Colors, when Brooke breaks her arm, Aly has to bring in a replacement. But what if the new helper is even better at manis and pedis than Brooke is?